What Happens to Good People? Every so often something happens that leaves me a bit flummoxed. Yesterday I lost a friend to cancer who was a very special person. She was smart, vibrant, energetic, an encourager, loved life, faithful colleague, and a good friend. She was what is known as “good people.” Still she had little use for God or faith. She was good at being a good person. How disappointed she must be today, having reached the end of her life and finding that her goodness was not enough. This is painful for me as I reflect. Not because I didn’t share truth with her, because I did. But, rather, because I did share the truth of Jesus Christ with her and to the best of my knowledge, she died having made a different choice. Choosing instead to judge God and her need for God based on the pain she saw in this world and her confidence in her own abilities. As much as she and I were honest with one another, and trusted each other, she simply could not go with the truth that I had shared with her. She believed I was a genuinely good person, but could not give God credit for that. In fact, she wrote a glowing testimonial to our church elders regarding my qualifications to lead the church. Somewhere in her background, God was the purveyor of pain and suffering, but man, through his goodness, rescued himself from a cruel God. This is a painful experience because it is real life! It is seeing the reality of “good” people who reject belief in or faith in Jesus Christ slip into an eternity of loss, death, and the torment of eternal separation from God. I’m reminded of a funeral I attended for the husband of one of my employees. The man had committed suicide and no one in the family was a believer. I was impacted emotionally for several days by the lack of hope that was present in that funeral parlor. There was no discussion of the life beyond death’s door. There was just … nothing! Poor Jim did as well as he could, but he’s gone now. In the current situation, I would desperately like to believe that she made a last minute decision to believe, much like the thief on the cross. God’s word tells us that it is by grace we are saved, through faith in Christ, and that even our faith is a gift from God. How good we’ve been is irrelevant so that none of us can boast in how we earned our way to eternal life. Nor are we able to compare ourselves to those around us, because God tells us not to judge one another, lest we be judged by that same measure. It is God’s job to judge. It is our job to love our neighbors. He also tells us that He (God) loved the world so much that He gave His only Son to be the perfect One who, through His death on the cross, would pay the price for our (yours and my) sins. Then He says, whoever will believe in this redemption story, will not perish (suffer eternal death) but would have eternal life with God. It’s way too simple for many people to believe, but it is truth. It is the only truth that matters in life. It is so tragic that people who have heard the good news of Jesus, decide that they would rather go to heaven on their own terms. Good people will die wondering how good is good enough. 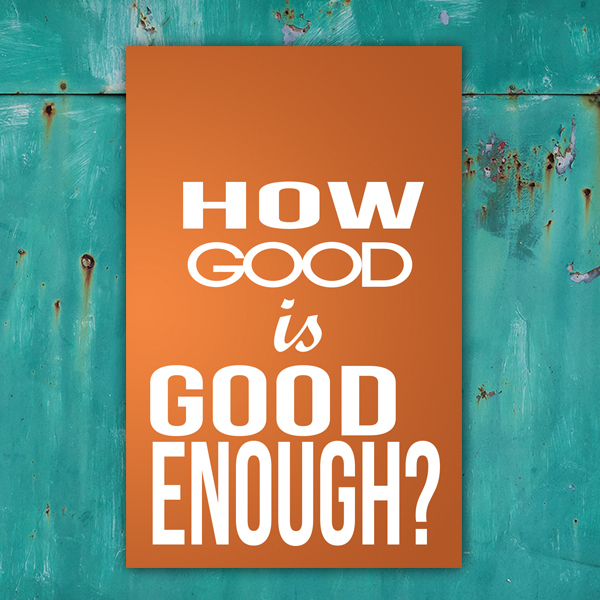 Andy Stanley has written a book entitled, “How Good Is Good Enough.” If you have this question lingering in your mind, pick up that book and read it. I think that once confronted with the question, you’ll be challenged to find some better solution. While this may be a morbid topic for some, there are some nuggets of truth here that needed to be heard and heeded. Hoping you have made the right decision for eternity.